First, I want to thank God for His abundant grace as we made the move over to the middle school. Of all the things that could have gone wrong, only minor hiccupps occured. Thanks to all those who gave and worked, you are too numerous to list. Easter weekend began with 81 coming to the Saturday night service, and two people accepted Christ as their personal Savior. Then at 9:00 on Sunday we had 133 in service and at 10:30 we had 286 with 4 more decisions for Christ. 27 others indicated a rededication to Christ and 7 signed up for baptism. In addition, over $7,000 was given in our Easter Offering towards the building of our next Hope Center in San Lorenzo. Story 1 begins a long time ago in a land far away.... well kind of. Early on in the life of our church we had a couple nammed Jim and Celeste, they came to church, came to Christ and then moved away to Baharain. Last year for a few months they returned to this area and thought they might settle back here. Needless to say we were thrilled. Their son now in Jr. High attends the youth group and on one occasion invites a friend to an activity at church. Long story short, a few months pass and employment demands that they move back to Baharain. The friend of their son forgets the name of the church but tells the parents that he wants to come, but because he cant remember, they do not. Then, our Easter Ad shows up in the mailbox and he sees it and tells them that this is the church he was telling them about. Yesterday morning, both parents accepted Christ as their Savior. Story 2 also begins far away, with a familiy getting ready to go to FL on Holiday. 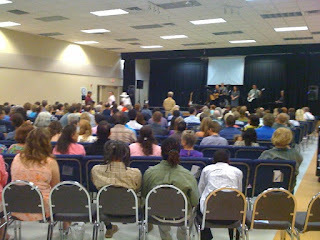 Being Easter, they decide to attend services at a local church, Cornerstone. Coming in late the only seats left are on the front row, and if you are a baptist you know how bad that can be! After church, while people are snapping up pictures and children are snatching up Easter Eggs the dad comes over to thank me for the service. I apologize that he had to sit on the front row and he said it was the best thing that could have happened. He goes on to tell me that his wife is the church goer, and that he was too embarrassed to raise his hand, but that today he prayed to receive Christ as his Savior. He said, for the first time in my life, I actually understood it! Story 3... got an Easter at Cornerstone story? Send it to me and I will post it here. I just wanted to tell you yesterday's service was amazing. I could feel God's presence working and started to cry when I heard you as you were acknowledging those who were coming to Christ. It has been almost 4 years now since our family came to Cornerstone and made it home. We were welcomed with open arms and hope we helped to do the same for others who have joined us since. It pains us to leave you all as we set out on this new journey God has before us. We know God is good and we pray he leads us to a church home as warm and inviting as Cornerstone. Our prayers will continue to be with you as you grow and lead others to our Lord and Savior. We love you and everyone involved with Cornerstone! W O W !!!! God must be doing a belly laugh!